Turn Your Smartphone Into a Miniature Casino that You Can Play Everywhere! Nothing can get the blood pumping more than when you put a small fortune into the slot machine. With just one pull of the lever and a few spins of the wheels, you could either win triple the amount of money you put in or lose it all. Beating the slots can be tough, as they rely on having sharp eyes, quick reflexes, and lots of luck. Unfortunately, playing them is also very inconvenient. For one thing, slot machines are large and cumbersome devices. For another, nobody wants to see their entire life savings get eaten up by a machine. This is where Slotomania – Slot Machines comes in. With this handy app, you can play any number of colorful slot machine games from your smartphone or tablet computer. Play them anytime and anywhere at no extra cost! The basic premise behind Slotomania could not get any easier. You just drop a virtual coin into the digital machine, push the button, and let the wheels do the rest. The fate of your game will depend on just how those guys will spin. If fate is on your side, you’re going to win big enough to play some more. If your luck is dry, then you’ll soon be exiting the app as a virtually penniless gamer. Determine how many coins you want to gamble away with each spin. Get the wheels spinning with the simple press of a button on your touchscreen. Win free spins that cost you nothing to spin. Decide how many rows you would like to match up. Slotomania is an accurate name for this package. The makers went absolutely crazy in making and compiling the astonishing number of slot machines you can play. When you first start out, you’ll have only a single machine to spin. As you win more games, you will get the opportunity to unlock even more games that grow increasingly more insane. Each slot machine has its own unique style, look and jingle that plays every time the wheels start spinning. Play Spooky School and try to match up a macabre collection of monster children and school supplies. Spin the wheels of Flaming Devils to risk your soul and your money over a collection of lovely angels who were obviously too hot for Heaven. 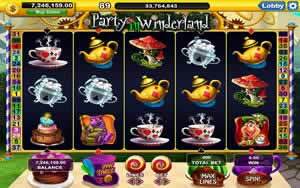 Go mad with wonder at the most whimsical slot machine of all: Party in Wonderland. Match up the most mixed-up assortment of strange creatures with Cash Creatures. Unlike real life slot machines, Slotomania can be made easier for you if you have at least one friend around to give you a hand. It’s still a singleplayer game, but somebody watching your back will allow you to win a whole lot more. 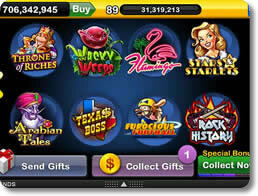 Send and receive gifts to and from your buddies in a way that will help everyone with their virtual gambling endeavors. Get free spins and tokens. 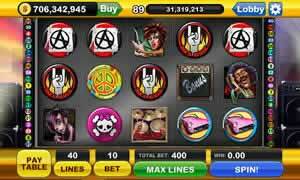 Slotomania – Slot Machine is far and away the best mobile slot machine experience you can get. There are countless slot machines you can play in this compilation, each of which are well designed to stand out from the crowd with their unique personalities. In short, there’s limitless fun to be had with Slotomania. If you enjoy a good spin of the wheels, then get this game immediately. It’s an instant jackpot.